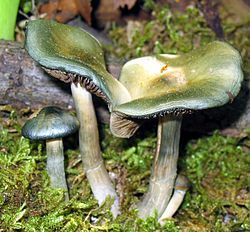 Psilocybe ovoideocystidiata is a psilocybin mushroom in the section Stuntzae, having psilocybin and/or psilocin as main active compounds. It is closely related to P. subaeruginascens from Java, P. septentrionalis from Japan, and P. wayanadensis from India. This mushroom was first documented by Richard V. Gaines in Montgomery County, Pennsylvania in June 2003. Although it is sometimes confused with Psilocybe caerulipes, it can be distinguished by its rhomboid spores, larger stature, earlier fruiting season and membranous annulus. From the abundant ovoid pleurocystidia and cheilocystidia. Cap: 1 — 4.5 cm across, convex to subumbonate, chestnut or orangish brown to yellowish brown to pearly cream color, hygrophanous, glabrous, sub-viscid, translucent-striate near the margin, from slightly to highly undulated in maturity, with irregular yellowish, brownish, or bluish tones, sometimes white when dry. Flesh thick, pliant. Bruises blue and green where injured. Gills: adnate attachment and range from whitish to rusty brown, lavender, or dark purple brown. Spore print: Dark purple brown. Stipe: 1.5 – 9 cm by 1 – 7 mm, equal, somewhat subbulbous, hollow, base sometimes hypogeous, smooth at the top and often having small scales near the bottom, colored whitish with irregular yellowish, brownish, or bluish tones. The partial veil is variable, ranging from a thin cortina that leaves a barely perceptible annular zone, to a substantial membrane that leaves a fairly persistent annulus. Microscopic features: Spores (7–) 8–9 (–12) × ( 5.5 – ) 6 – 7 (–8.5) µm, rhomboid to subrhomboid in face view, subellipsoid in side view, thick-walled, with the wall 0.8 to 1.5 µm thick. One end of the spore has a broad germ pore and the other side has a short hilar appendage. Two types of cheilocystidia and pleurocystidia are present. One type of pleurocystidia measures 16 - 24 x 6 - 8 and is venstricose-rostrate. The other type is larger, 20 - 40 micrometers by 12 - 16 micrometers, globose-pyriform, sometimes with a narrow apex and narrow base. The basidia are 4 spored and measure 20 – 28 × 7 – 9 µm. Psilocybe ovoideocystidiata is mainly native to the eastern United States, in a range that stretches from Kentucky to Rhode Island, but has been found as far south as Georgia. It is common in the Ohio river valley, here it is often found in the woody debris of overflow areas, along rivers and streams. More generally, it is often found in man-made mulch and wood chips. More recently, it has turned up in the western United States, in the Pacific States from Western Washington to Southern California, though it is still a relatively uncommon species in this region. It has also been reported from Europe, specifically in Switzerland and southern Germany. Seasonality varies a great deal depending on what region they are found in, but in the northeastern US, are most common from April to mid June but they occasionally fruit as late as November. ^ Guzmán, Gastón; Gaines, Richard V.; Ramírez-Guillén, Florencia (2007). "New Species of Hallucinogenic Psilocybe (Fr.) P. Kumm. (Agaricomycetideae) from the Eastern U.S.A." (PDF). International Journal of Medicinal Mushrooms. 9: 75–77. doi:10.1615/IntJMedMushr.v9.i1.90. This page was last edited on 15 October 2018, at 21:59 (UTC).